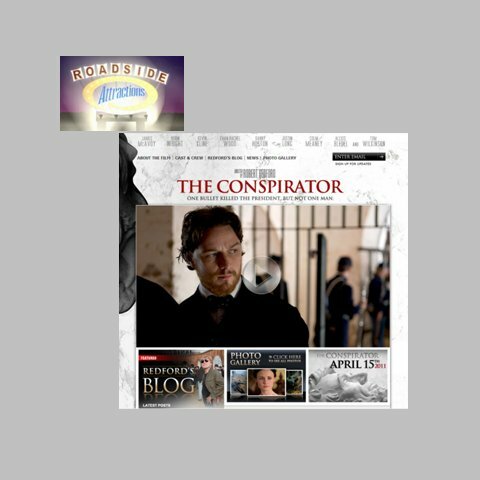 Working with Specific Impulse alumnus Brian King, social media guru Bryce Tom, and the good folks at The American Film Company, I developed and managed the microsite for the Roadside Attractions film The Conspirator, a major motion picture with an all-star cast directed by Robert Redford. The site features streaming video using Brightcove, Google Analytics Event Tracking, Facebook integration, 3rd party application integration, a photo gallery, cast and crew bio pages, and a WordPress blog for Robert Redford (which I also managed). ConspiratorTheMovie.com makes use of advanced SEO practices: only two months after the site went live on Feb 15, 2011, the keyphrase “the conspirator” placed #1 on Bing and #3 on Google, and attracted over 280,000 unique visitors via Search. SEO included keyword analysis and optimization, an XML site map, registration with Google and Bing webmaster tools, and guidance to the marketing team for the link-baiting strategy.